"I'm still astounded by some people's reaction to things I consider quite normal." A foghorn booming in the distance, seagulls flying overhead, waves crashing, and bagpipes blaring all set the scene for Jean Paul Gaultier's fall couture runway show, where he transported the audience to Brittany, an idyllic seaside region in France. As models appeared wearing trench coats and velvet dresses, onlookers feasted on crepes that were passed around on trays. 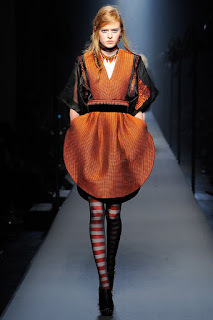 Gaultier captured the area's rich history and Celtic heritage by incorporating stripes, large headpieces, and embroidery into the designs. He also introduced voluminous round skirts that Effie Trinket would like to get her hands on. They seemed to defy gravity and were a true work of art. To end the show on a high note, a traditional pipe band appeared on the runway for the grand finale as Mr. Gaultier debuted the most extravagant gowns. They then proceeded to march off the catwalk following their flag. After a busy summer with not a lot of sewing time, I placed a massive fabric order with Mood Fabrics. It's always like Christmas to receive a large box of brand new fabric. Two unique textiles that arrived with the shipment were a Rag & Bone black lace and a cotton material with an abstract black and white design. I got to work draping and creating new patterns for a top, collar, and skirt. I used those new patterns that I had perfected for two dresses. The only difference is the gathered Rag & Bone black lace used as an overlay on the skirt portion of the olive green one. They will be great transition dresses as summer turns to fall.